Local Gopher Exterminator Company is outperforming the competition! When you are ready to call a local gopher exterminator company to get rid of the gophers causing all that damage to your lawn, shrubs, plants, trees, and more, remeber to call AmeriGuard Pest Defense in Hemet CA at 951-652-0505. 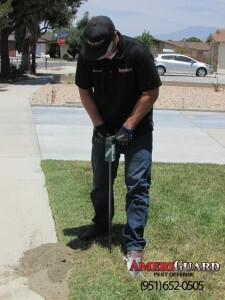 AmeriGuard Pest Defense has been the Local Gopher Exterminator Company providing superior service for many people in Southwest Riverside County for years. Our gopher treatments vary in price depending on the severity of the damge as well as the length of time the problem has been occuring. If you live in Hemet, San Jacinto, Menifee, Murrieta, Temecula, Sun City, Moreno Valley, Beaumont, Banning, Perris, or any of the surrounding areas and you need a local gopher exterminator company call 951-652-0505 today. Prices can range from $99 for a one-time service for problems which are less than 2-3 weeks old. Gopher issues which are typically more than 3 weeks old are recommended to be put on a 3 part treatment. The three part service consist of the initial service with two follow ups one week apart from each other. In properties in which the gopher issue has been there long term, there may be a necessity to put the home on a regular monthly service until the gopher problem is under control. There are many environmental factors which are the cause of many gopher issues. Any recommendation that can help reduce the overall gopher activity will be observed by our technician at the time of the original service. we will provide you with any valuable information which may help reduce the possibilitiy of a future infestation. It is very important to remember that for homes with very high gopher activity, control may only be accomplished when treating your home and having any surrounding neighbors with the same issues do the same. 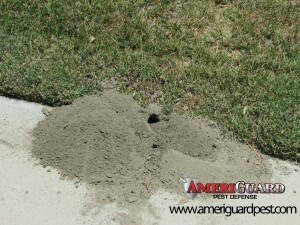 To learn more about the techniqes and products used to get rid of gophers at your home please click on the link below.